Fly fishing goals may seem like a bit of overkill when thinking about the new year. But life often crowds out the good, so setting some fly fishing goals helps us focus on what, truly, is most important. In this episode, we discuss our goals for 2019, which includes more time on the water (with family), honing some skills, and definitely more days on the river (with no family!). Great Stuff from Our Listeners. What fly fishing goals have you set for 2019? Please post your answer below – and we may discuss your comments at the end of one of our next episodes! We would love a referral from you. Simply mention our podcast to your TU chapter or fly fishing club or even local fly shop. Thank you for your trust. 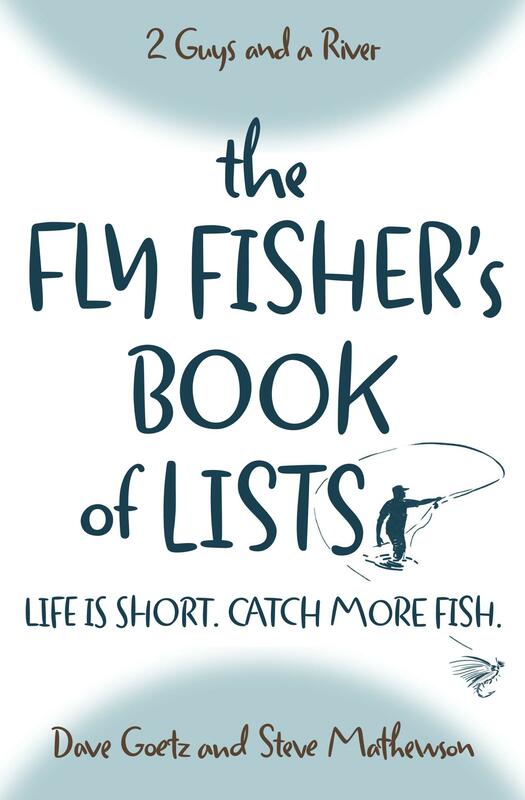 Are you a new fly fisher? Or someone who needs a couple fly fishing hacks to improve your skills? This book is like a plate of hors d’oeuvres. You simply can’t have one. Read one list, and you read the next. Visit Amazon to buy your copy today! Another great podcast. I was just taking about this very subject with the wife the other day. Myself like Steve. Have made it a goal to get in shape. Although it started in June of 2018 it continues as a goal for 2019 . Up to this date I have lost 42 pounds. Which required a change of diet . I had to remove allot of salt from my diet per my doctor. As well as lower my intake of fatty foods. 🙁 I was put on high blood pressure medications in June of 2018 . At the age of 58. That was the big signal to get my act together. Since losing the weight I feel better, have more endurance and best of all off my meds. Now for my fishing goals. I have been studying old classic wet and soft hackle flies. I am learning to tie them and my goals are to catch fish with them this year. I think this change in style of fly fishing will give me instinctive to fly fish more another one of my goals. Next I’m trying to plan a lifetime dream of mine to either fly fish Alaska or Labrador. I would love to do this by next summer. After all at 58 the window is shrinking if you know what I mean. My next goal is to try and get the wife back into outdoor activities. When we first met we went everywhere together and fishing camping was a big part of it. Over the years and our busy lifestyle that kinda slipped away. I think it would be wonderful if we could rekindle that. Good for you, David. Good for you! Losing weight + renewed interest in soft hackle flies + getting your wife back into the outdoors = a good forecast for the coming year of fly fishing. All the best to you!